Saundra Cleola Walker aka "Peanut"
A beautiful flower that has been up rooted and transmuted to the next phase of life. A beautiful flower that had her bouts with struggle and strife, trials and tribulations. But she had no hesitation about living to the fullest. Her life relations were built on caring, giving, and sharing. Sharing the lessons of life that one could look back on and say, that's what she meant when; she didn't let me do it my way. Giving her all in whatever endeavor she was involved in always with a grin no matter with her or him. When they thought the light of life was dim she brighten it up for them. Then they felt the flow of peace again. Caring for all that she came in contact with, laying no blame for whatever circumstances they were in, not even if you were living in sin she would bend over backwards just to bring you around again. 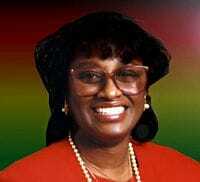 Saundra Cleola Walker a beautiful spiritual flower, a eloquent speaker and a stylish Walker lived a full life she wanted us to know and her spirit is here to help us CONTINUE TO GROW. Just look at the examples she left for us just reflect and you will remember them. One more thing this beautiful flower wanted us to know before she had to go. She had a long talk with her Lord before she took her spiritual flight. I have all my affairs in order and the people in place to deal with my case so let me lace my spiritual shoes cause in your bosom how can I lose. Saundra so loved the Lord our Father that among many things that she did one was the Director of Children's Church at Peace Baptist. Saundra love the children and she whole heartly believed that when you raise up a child in the right way that they would be productive members of society. Saundra thought that all children should have a goal in life. She wrote: " Setting A Goal for Ourselves: Well in order to do that , you must know yourself and what direction you want to pursue. If you live this life long enough, we will run across many people who will draw their own ideas of what and who they think you are, but the ultimate and most important thing is who you KNOW YOU ARE. Set it and do not deviate away from it." To honor Saundra's inspiring and incredible life The Ark of Self-Healing & Self-H.E.L.P (Health Education for Longevity & Peace) has developed the Beautiful Peals Basket and leadership program certificate for young girls.